I got an Alcatel OneTouch Evolve yesterday ($30 Walmart Family Mobile deal) as a backup phone. Immediately after booting it up, I noticed a stuck blue pixel on the upper right corner of the screen. I can deal with this, and I plan on exchanging the phone for a new one. But one big annoyance is that the phone does not seem to play well with third party launchers. The culprit seems to the Google search app, the newest version in particular (3.5.16.1262550). 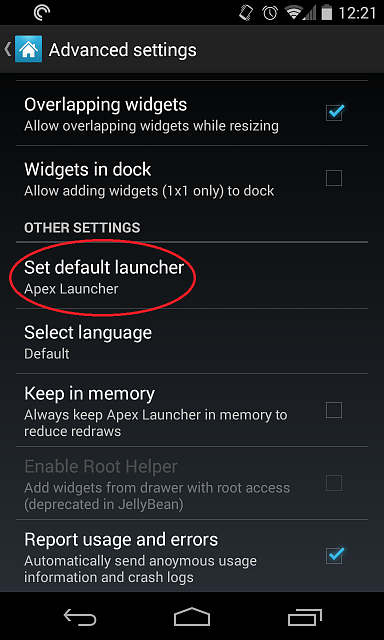 If I have a third party launcher installed, like Nova or Apex, for instance, and I have that launcher set as the default, and I proceed to open the Google search app, next time I hit the home button, it asks me to choose a default launcher, either the stock Alcatel one or Nova, for example. Its very annoying. The catch is if I uninstall updates to the Google search app, and I go back to the stock version of the app (2.4.10.626027), the problem disappears. This is a temporary fix, but its not ideal. I've reproduced this problem a few times, including after a factory reset. Stock OneTouch Evolve, unrooted 4.1.2. Anyone else notice this or know of a fix? Thanks. I have done that. I always choose to make whatever launcher I'm using the default. Furthermore, I've gone into Nova's settings and have set it as the default. Doesn't matter. It must be this version of Google Search that's screwing with things. is it possible? no launcher, change theme/icon? Can I disable LMT Pie Launcher's status notification? How do I access TouchWhiz home from Apex Launcher?